As a teacher, I'm constantly faced with a frustrating challenge: eliminating boilerplate code from demos. If students have to type a lot of boilerplate code before starting a demo together or an exercise, valuable time is lost and they don't get the same knowledge — and since this is a service industry, that's not good for anyone. Uploading the code to Github, or OneDrive, or whatever. This doesn't work for two reasons. For reason one, see the next bullet point :) Reason 2 is that no matter how ridiculous that sounds, I go to places where these sites are blacklisted or placed under a quota quite often (I once consulted at place where the Nuget server was blocked; the Nuget server). Even if I upload the code somewhere, I have to send a link to them somehow. This NEVER works :) There are always late additions to the participant list, so I cannot send them anything ahead. Also, ever since GDPR kicked in, everyone freaks out when I ask for e-mail addresses. Finally I came up with a somewhat working solution: project templates in the form of Visual Studio extensions. The extension server is usually not blocked and everything is easily reachable, searchable from Visual Studio itself. As a pilot, I decided to create a project template for my Language Integrated Query training material. If you want to check it out, go ahead and download it from the marketplace. 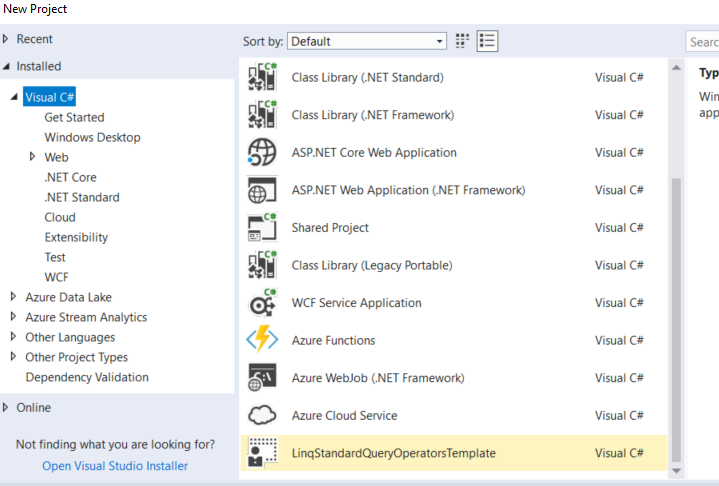 The template is a console app-based project template to help you demonstrate how the standard query operators of the Language Integrated Query, LInQ work during your classes, courses or demos. In order to realize these goals, the basic console-app template is extended with a simple data model, a data repository and some extension methods. The data model is based on the late-and-great Northwind database, or at least parts of it. You can find the elements of the data model inside the Model folder of the project. The Product class represents a product that you can buy at a store. The Category class represents a product category; basically a product group (e.g. "Books", "Drinks"). 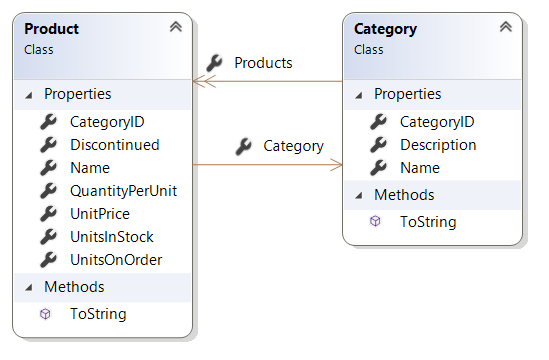 Note that everything is wired together by reference and there is exactly one of each object in the data source, no matter whether you access it directly from the data source, from the Category property of a Product or from the Products property of a Category. This is an important piece of information when discussing operators that do equality comparison, like the set operators, joins or GroupBy(). Note that both classes have their ToString() method overridden to return the value of their Name property. Note that the namespace of the model classes, Model is already referenced in Program.cs. If you add other files, you have to add the reference to the namespace yourself. The properties are instantiated and populated in the static constructor of the class. The data for the properties come from the two XML files in the DataSource folder, which were exported from the Northwind database using the DataContractSerializer. Please make sure to make your students aware that the static class and static properties are only used here for the sake of simplicity and this is by no means a best practice to implement data sources. Note that the properties are actually of type List at runtime. Note that the namespace of the DataRepository class, DataSource is already referenced in Program.cs. If you add other files, you have to add the reference to the namespace yourself. Can dump IEnumerable collections if T is a C# primitive type, enum, DateTime or TimeSpan. In this case, the values are simply output to the console, one value per line. 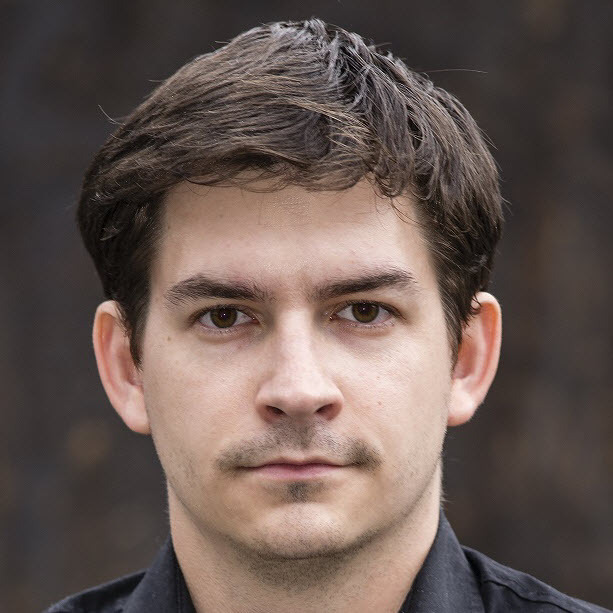 Can dump IEnumerable collections of complex objects. In this case, the readable properties of the objects type that are of a C# primitive type, enum, DateTime or Timespan are output in a table-based format. If a property is of another type but the type overrides ToString(), the property is also included in the table and ToString() is used to print its value. Otherwise the property is omitted from the output. A header with the property names is also printed. When the output is displayed you have to press enter to allow execution to continue. 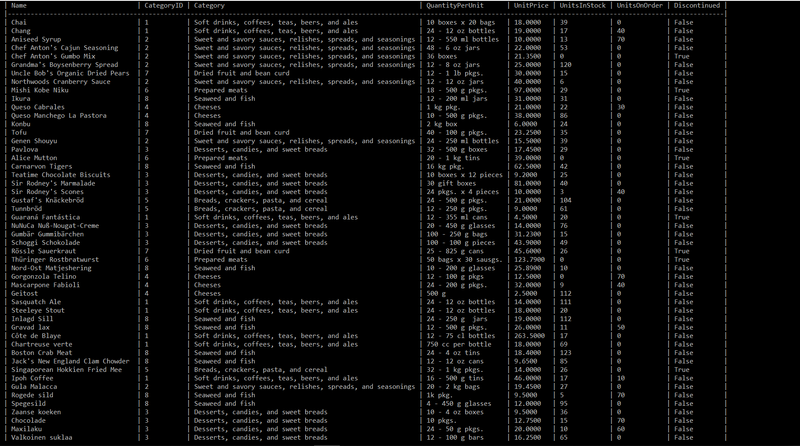 The console window is maximized automatically. Note that the namespace of the class of the extension method, Extensions is already referenced in Program.cs. If you add other files, you have to add the reference to the namespace yourself. Please make sure to discuss with your students how LInQ query evaluation works and the inner implementation of Dump() triggers query evaluation. So if you are interested, go ahead and download it from the marketplace, maybe it can help you break down boilerplate in your own presentations. You are welcome to use this extension during your presentations, classes or courses with the limitations of the MIT license (which is not that much :) ). But use it at your own risk :) and always test your demos beforehand (especially in the case of Dump() which was not tested extensively). If you have ideas, requests or comments, visit the Github page of the extension. For other teaching aids and materials, check out the other teaching related posts on this blog.